The Baldwin Hills began forming 10 to 26 million years ago through movement along the Newport-Inglewood fault, which produced the dome-like shape of the hills, and later the central south-north valley now traversed by La Cienega Boulevard. The Baldwin Hills continue to move at a rate of 2 ft every millennium. The Baldwin Hills are part of a north-westerly trending chain of hills along this fault, extending from Rancho Park in the north all the way to Newport Mesa in Orange County. 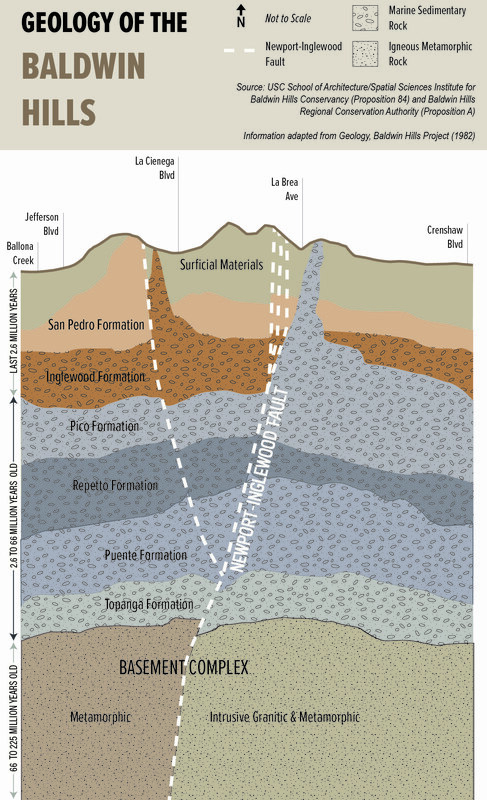 Movement along the main Newport‐Inglewood fault line over thousands of years is the recent expression of millions of years of burial and deformation of the sedimentary rocks, which overall provided a subsurface environment that allowed and natural gas to form at depth, and to collect beneath the Inglewood Oil Field, Wilmington Oil Field, and Signal Hills. Oil was first discovered in the Baldwin Hills in 1924, and one year later peak oil was reached with a rate of 50,000 barrels of oil per day. The fault has not had major seismic activity since the Long Beach earthquake of 1933 (6.3), but smaller earthquakes and subsidence, or sinking of ground, have been documented in and around the Baldwin Hills. Beneath the soil layer of the Baldwin Hills is 10,000 to 14,000 ft of sedimentary rock from the Tertiary and Quaternary periods. Within the Tertiary rocks, there are four formations: Topanga, Puente, Repetto, and Pico. These rocks consist mostly marine sandstones, shales, and siltstones from the Miocene and Pliocene. The Pico formation is exposed in Baldwin Hills on the east side of the Newport-Inglewood Fault. Within Quaternary rocks are the Inglewood and San Pedro formations. These rocks consist of sandstone, conglomerates, and siltstone and are often weak enough to crumble under hand pressure. Intermixed with the bedrock are surficial materials (recent deposits) from surrounding parent material, artificial fill by humans, or deposited by streams or rain. Beneath the more recent rock layers is the basement complex of Mesozoic age (65-225 million years old). This consists of igneous metamorphic crystalline rock. Movement along the Newport-Inglewood fault created two types of rock in this basement complex: a western block of metamorphic rock and an eastern block of intrusive granitic and metamorphic rock.